...AND Make Your Business Known Worldwide! In today's fast moving and information driven world, to succeed in your tourism related business you need your target customer to be aware of your existence. That can occur in many ways: word of mouth, advertising in magazines and brochures or promotion by other means such as websites, travel agents and so on. However, advertising offline or just having a single page website is no longer enough! Because most tourists start preparing their perfect trip a few months before. Today, nearly everyone searches for travel information and make arrangements online before they depart. So by the time your advertising is seen offline, they have already made decisions or booked their accommodation, restaurants, car rental and excursions. Therefore, only placing ads in newspapers and magazines has become less effective and more expensive. These old way of advertising is a one-time placement and only provide limited geographical exposure to a semi-targeted audience. Moreover, nowadays customers tend to avoid commercial websites. Rather they prefer and trust personal information business sites managed by real people who have found solutions for problems or situations and are now providing reliable information and useful services for others to utilize. The bottom line is presence of trust both online and offline is critical for decision making. Money can't buy it! 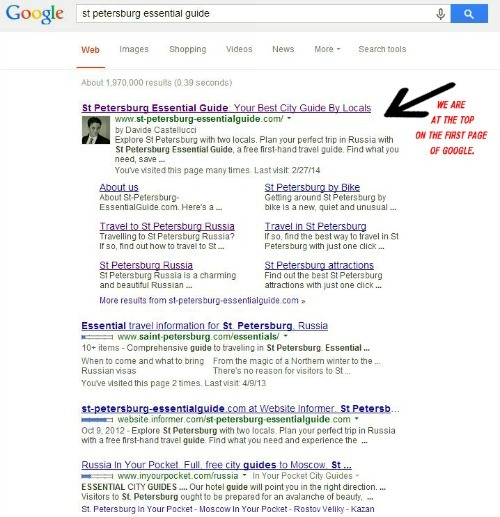 One of the most effective and best ways is to be seen on a website with high traffic and relevant high-quality content, such as St-Petersbrug-EssentialGuide.com. Website visitors land to our site for one reason, to find and gather information for their upcoming vacation in St. Petersburg, Russia. They want to know many things... where to stay, where to eat, things to do and places to visit, what to expect with the weather, etc. ...We, Anastasia and I (Davide), provide just what they are looking for - comprehensive information, including accommodation, restaurants, tourist attractions, tour guides, airport transfers, travel tips along with an English back up. In short, everything they need to plan their trip and enjoy their stay. For this reason, our international audience makes St Petersburg Essential Guide a unique attractive environment for advertisers, especially for locals and those with a travel topic or business content related. So if you want your business to be seen by potential, then a new travel site such ours can be a perfect vehicle to do that. With us you will reach the right kind of visitors and pay less than any traditional form of advertising. St-Petersburg-EssentialGuide.com is a rising and highly respectable travel site, currently one of the most visited on the internet. Being written by two locals it has become an authoritative, trusted source of information. And due to that our site differ so much from other similar sites. We are two locals who have the web tools and local expertise to continually add topics which large numbers of prospective visitors are searching for year after year. 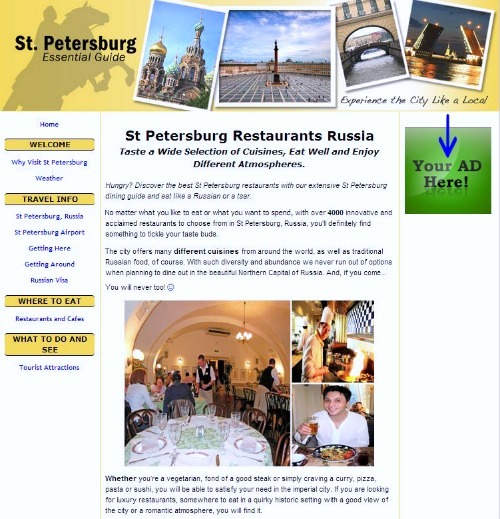 In short, if you advertise on St-Petersburg-EssentialGuide.com, your sponsorship campaign (Ad) will be on a respected, quality website that’s visited each day by scores of future visitors to Russia and people who are otherwise interested in the city. And, good for you, Ads will not be tucked away in a corner of the site, where nobody looks, but all ads will be in the main content area of the site, meaning in the course of the articles where the eyes are. 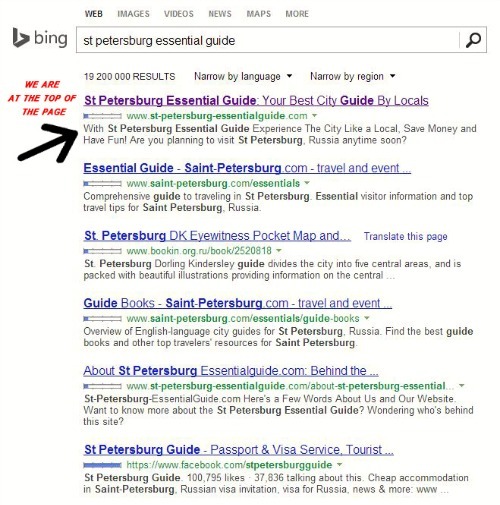 St-Petersburg-EssentialGuide.com is still a young website but its growing fast! The site draws over 30,000 unique visitors per month, especially from North America, Europe, UK, New Zealand, India and Australia, many of whom are preparing a trip to the imperial city in advance. 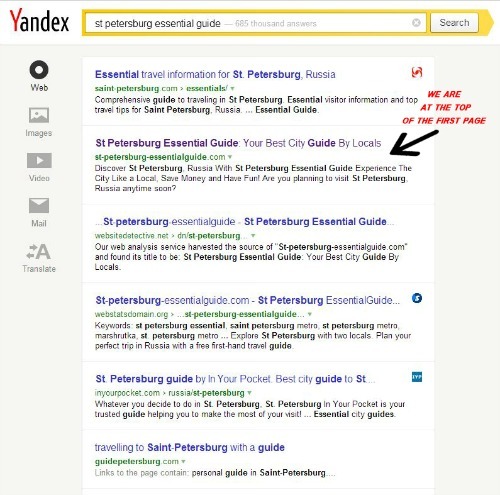 At the time we are writing we rank high on major search engines for several searches related to St Petersburg Russia, and on daily basis we receive an average of 1000 unique visitors straight from Google, Bing, Yandex and Yahoo. Moreover, traffic is rising continuously. If you are not on the first page of search engine sites, you know that you are wasting your money because 95% of people click on results on the first page, while just a few on the second. 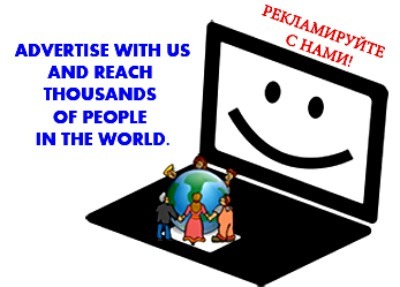 If you decide to advertise with us, you will be on the first page of Google and other search engines since day one. But do not take our word for it, check for your yourself! St Petersburg Essential Guide; Saint Petersburg Metro; St Petersburg Russia Restaurants; Taxi in St Petersburg; Monuments in St Petersburg Russia; Artist Attic and Fondue Bar; Fruktovaya Lavka Restaurant, etc. The list of keywords we have ranking higher are many and different and, of course, they may change monthly depending on the release of new algorithms and content. Example of a search on Google. Example of a search on Bing/Yahoo. Example of a search on Yandex. If you understand some geeky stuff about websites, you might also be interested in knowing that we currently have a good Alexa Ranking (Click Here for Checking by Yourself). This means that we're in the Top 1% of all the websites on the planet. Not bad! For your information, Alexa.com is an independent internet traffic indicator. In short it is the most popular web analytic tool used by marketers and advertisers to measure internet traffic and evaluate websites for media buying, partnerships, and other business opportunities. Again, don't take our word for it, check for yourself! Click on the link above, put the address of the site on the search box and compare our site with others! Remember, the Alexa rank is like golf, the lower the number the better! 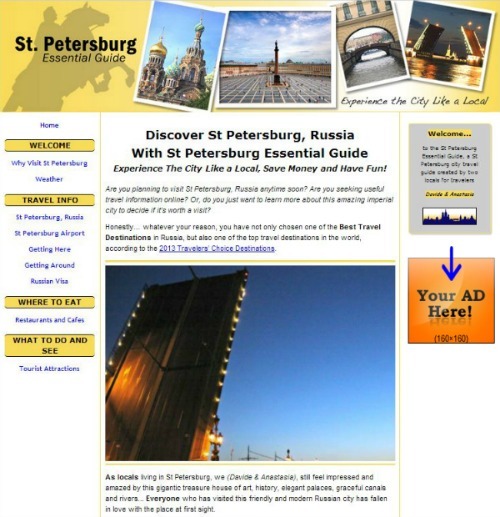 St-Petersburg-EssentialGuide.com is used by those interested in traveling to St. Petersburg or to those who want to learn more about it. Our visitors come from different parts of the world and are ready to make a financial commitment to spend money. Usually they arrive at our website because we provide them with what they are looking for. See below, a report taken from our Google Analytic Account and see where our visitors come from. We also thought you would be interested to know what age and gender our readers have. Therefore we've included below a report about demographics, which of course it may changes over the year. There are many ways you can advertise on our site. From Sidebar Ads, Banner Ads, Text Ad Links or even your Own Page you really have plenty of choices. See details below! SIDEBAR AD SPACE: They are very effective and a great way to promote your business. The right column of All Pages of our website, except for the administrative and clients pages. Each of the three options comes with a different price based on the amount of people that visit our site monthly. You can provide us with your image if you have one, or we can create one for you if you don't. For your information, we don't offer more than 5 spots per page, so each month we have a limited amount of space available. Your Sidebar Ads can be linked directly to your website and to a full listing page. Example of an Ad placed on the Homepage. Example of an Ad placed on a specific page. BANNER ADS: They are great for branding, portraying an image of what your company is about. You can buy one of the below banner formats which will be displayed on the top page content of our website. So to speak the most popular pages! 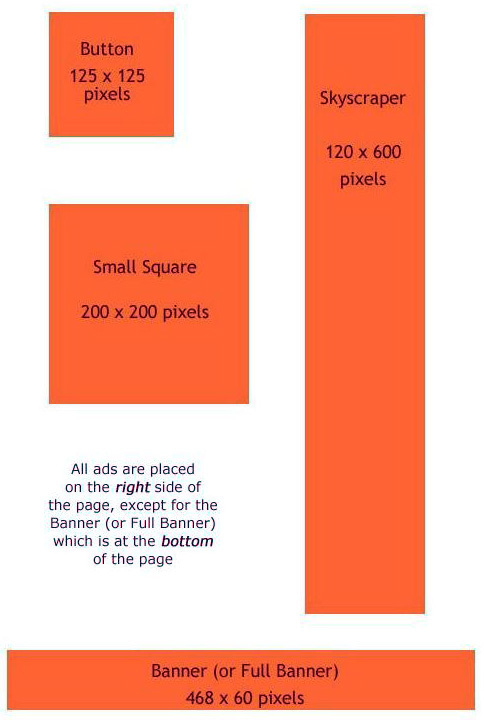 Tip: To understand where your ad will be, please look at the picture below. This site is organized in 3 layers: the homepage is “tier-1” and obviously gets the most visitors. In the main site menu are the buttons to the “tier-2” pages. They are important hub pages and get more traffic than tier-3 pages. In the tier-2 pages, or at their bottom, are the links to tier-3 pages. This is where most pages are. 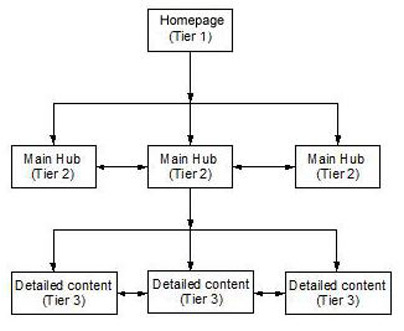 All tier-3 pages always link to all other related tier-3 pages and “up” to the tier-2 pages and homepage. TARGETED TEXT AD LINK PLACEMENT: A cheap and simple way to promote yourself! We can strategically place two type of Text Ad Links: one inside the box, one outside the box on pages where it’s best suited for the type of service or business you offer. The ad inside a box have the same lay-out and background color as the rest of the page. So it tend to blend in with the site’s content and get many clicks. While the ad outside the box is just a simple short review or intro description of your business/service. The writing text for both Ads is set to a max of 150 characters (though you’ll often need less text to get your message across. They can be placed on a targeted page or on a page content related (see example below). Example of a targeted or specific page where your Text Ad Link will appear. Sample of a Text Ad Link outside the box. Sample of a Text Ad Link inside the box. We can create a unique web page about your business or service under your business name with a description of 300 words, a photo gallery, all the info you want us to put on the page, contact details, a link to your official website and an optional booking form, including Google Map and a Comment Form. The page will stay on our website for as long as you want, minimum 12 months, and it can be renewed annually. Please see a real example here for a Full Listing Page Ad. At an additional cost, we can also list your business on Google Business Places, take new high-quality photos to publish on your new own page, and even make an online English Menu. Please see a real example here for a Google Business Page. Adding your own page and any extra features mentioned above to your business will boost your presence online and offer a great experience to your potential customers. If you visit our Homepage you can find other real examples, just look under "recommended" on the right side of the page. Note: Ads are awarded in a first-come, first-serve basis. A page can only contain one regular or wide skyscraper, for example. So be quick to claim the good spots before your competition does. 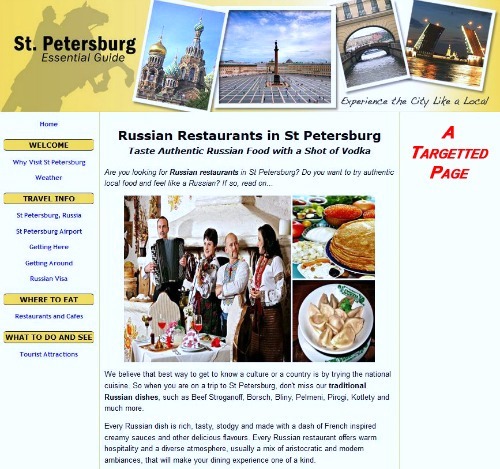 We only accept sponsorship requests from high-quality establishments that fit the tourism/travel theme of this website or relate to St Petersburg Russia. We are mainly interested in featuring hotels, restaurants, rental apartments, cafes, shops, clubs, tour operators and helpful travel companies offering services or products that can help our visitors. First, we will evaluate your business or service, then if it is suitable for our website and good for our readers, we will discuss with you what advertising option may work best for you. Together we can build a program or write a compelling review that brands your business and direct-response-markets your product straight to customers who are seeking what you supply. We win: by getting financial support to maintain and run this website so we can continue to provide exclusive content on the site for our readers. Do you want to get more customers? If you do, then get in touch with us today by filling in the form below. After receiving your request we'll contact you shortly for further details. Which advertising option you're interested in? What's the topic of your Ad or Business? Would you like to get our info package? Would you like to get our price list sheet?